This summer,the Alpha Eta chapter house at 534 W. Park Avenue, along with its two annexes, was demolished to make way for a brand-new home at Florida State. Construction of the 26,000 square-foot facility is planned to be completed by the fall 2019 semester. This new home, with its updated modern amenities, will provide a place to live, a place to learn and a place to lead for the growing Alpha Eta Chapter. The original house at Florida State was built in the 1920s as a single-family home. It’s been added on to and expanded numerous times through the years, including adding two auxiliary buildings. The addition of these annexes has resulted in inconsistent architecture and a segmented space that doesn’t allow for the sense of community that a chapter house should provide. The current house was designed for 50-60 members. Today, the Alpha Eta Chapter —with its more than 200 members —has far outgrown the space. Members can no longer dine at the same time, and chapter meetings are either held in a large classroom building on campus or the members must gather in the TV and informal living room. Additionally, the 90-year-old home is beginning to show signs of its age, including foundation and structural issues. With other fraternity and sorority groups on campus building new facilities, Tri Delta knew the time was right for a new home for Alpha Eta. 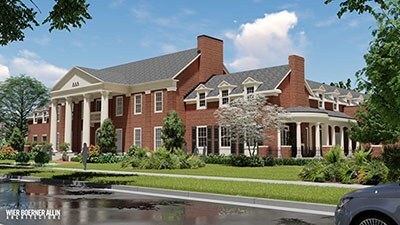 The $8.5 million project is the largest investment Tri Delta Housing has made in a single location, and to help fund the project, several dedicated Alpha Eta alumnae have coordinated and launched a capital campaign. Tri Delta is committed to ensuring Alpha Eta continues its strong presence on campus by providing a competitive, modern and comfortable home that helps our sisterhood lead the future of Alpha Eta. The new, modern facility is designed to accommodate and support a chapter of more than 200 women and 60 live-in residents. In particular, the façade of the new home is designed to look like the previous chapter house, paying homage to Alpha Eta’s 100-year legacy. While the outside may look similar, the inside of the house will be a beautifully updated and expanded space. The first floor features a formal living room, study lounge and den, house director suite, and a library to house historic items and memorabilia. The dining room is a multi-purpose space that doubles as a chapter room and comfortably seats 300 plus. Situated off the formal dining room is another flexible space that can either serve as dining room overflow – particularly on Monday nights when the entire chapter dines at the house – or a large study area. Connected to the first floor is an outdoor, crescent-shaped living space that features an outdoor fireplace and that can be utilized for expanded entertaining. The second story features 28 spacious bedrooms – including a president’s suite and dedicated alumnae suite – spa-like bathrooms, a spacious study room overlooking the back courtyard and a TV lounge with built-in kitchenette. The house also includes many amenities, such as energy efficient heating and cooling, upgraded Wi-Fi service, second floor laundry facilities and built-in bedroom furniture that provides privacy for each resident. While the Tri Delta experience at Florida State is certainly more than the physical structure of the chapter house, the home undoubtedly plays a significant role in the development of Alpha Eta’s members and is a proud symbol of the chapter’s shared values and goals. Most importantly, the house fosters a sense of community – a place where the women of Alpha Eta can develop strong, lifelong friendships with their sisters. And a place the women of Alpha Eta can call home for many decades to come.